What is the Selection List and why would it ever be used? As a Brain database grows, there will be times when you will need to mass edit thoughts, links, or other data associated with thoughts. When the selection list is activated, it will automatically appear in on the left side of the screen. Within the working window, the thoughts selected will have dashed outlines. The use of the Selection List can be a powerful feature when you have a Brain database with more and more thoughts. 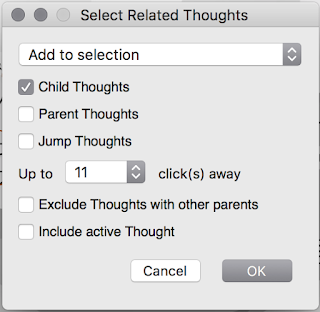 By choosing Select Related Thoughts from the Edit menu, a large number of Thoughts can be added from the direction of the Parent, Jump, and/or Child Gates. Using the Search Textbox narrow the results down to the items you want to add to Selection List. 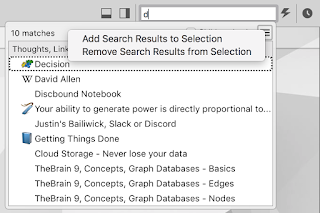 Open the popup menu in the search results dialog and click "Add Search Results to Selection" accessed by clicking the "☰" button. Manipulate the report options until the Thoughts, Thought Tags, and Thought Types desired are in the results section. If you any Thought added to the Selection List that has a Child Thought you can select "Show Common Children." "Expand generations from $x to $y" will add one generation of children to the "common child Thoughts" list. If only two Thoughts are in the Selection list "Select Path Between" becomes available. Clicking this option will add all Thoughts between the original two Thoughts. Repeating any of the "addition" steps above will remove items from the selection list. But you can also remove all items by clicking the X in the upper right-hand corner of the Selection List. What can be added to the Selection List? Now that multiple Thoughts are selected what can be done? Once you have filled the Selection List with the Thoughts, Thought Types, and Thought Tags wanted a right click on the selection list will bring up a popup menu. Remember: Copying Thoughts from one part of a Brain to another Thought of the same Brain will duplicate thoughts. It is recommended to link the existing Thoughts to the new part of the brain - see "Link Selection as $X" Below. 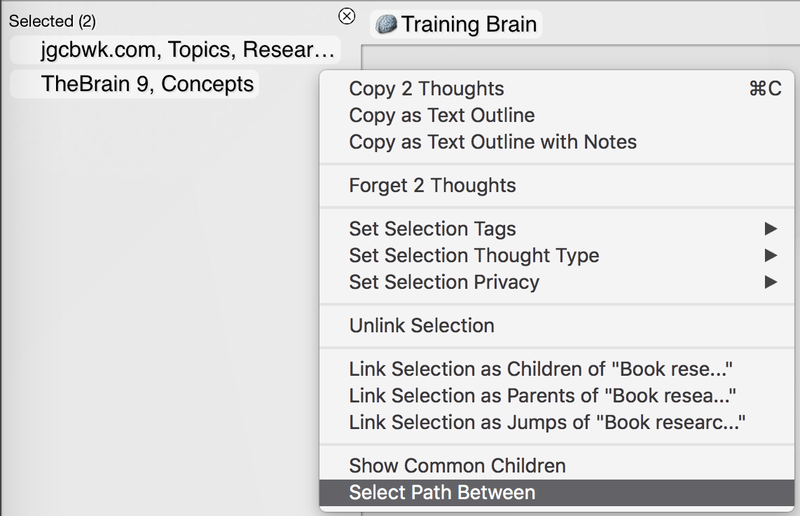 Just as with the "Copy as Text Outline" option this allows pulling text data out of TheBrain however if you have notes attached to a Thought they will appear as children to their related thoughts. This will cause all thoughts in the Selection List to be forgotten. You can still recover them if you need to. As one would expect this sets the Thought Type of all the thoughts in the Selection List. This is very useful when moving thoughts from one Brain to another with different Thought Types in each Brain. 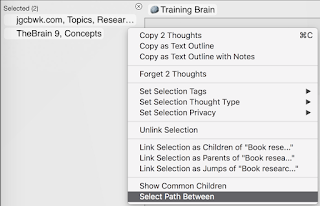 Link Selection as Children of "$ActiveThought"
Link Selection as Parents of "$ActiveThought"
Link Selection as Jumps of "$ActiveThought"
Selecting this option will connect all the Thoughts in the Selection List to the Jump Thought Gate for the current Active Thought. As expected any Thoughts that were Parent or Child Thoughts will now be Jump Thoughts. If you any Thought added to the Selection List that has a Child Thought you can select "Show Common Children"
What is a "Thought Tag"? 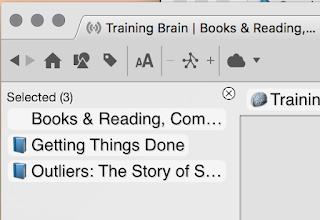 When working with TheBrain by TheBrain Technologies LP one of the most challenging features for me to understand was how to properly leverage "Thought Tags." The first question you might ask is "Justin, what is a Thought Tag?". A Thought Tag is an attribute that can be added to one or more Thoughts in TheBrain software to help identify commonality between Thoughts. A Thought can have more than one Thought Tag, whereas a Thought can only have one Thought Type. Above you can see how the thought "David Allen" has three Thought Tags attached to it. They are a pencil, checkmark of approval, and a U.S. Flag. 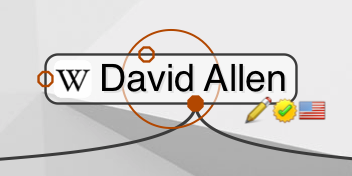 In this case, they allow me to know that David Allen is an author (the pencil), one of my influencers (the checkmark of approval), and from the U.S. (the U.S. Flag). Jump down to the Example Thought Tag section below for more examples of Thought Tags. How do you assign a Thought Tag? 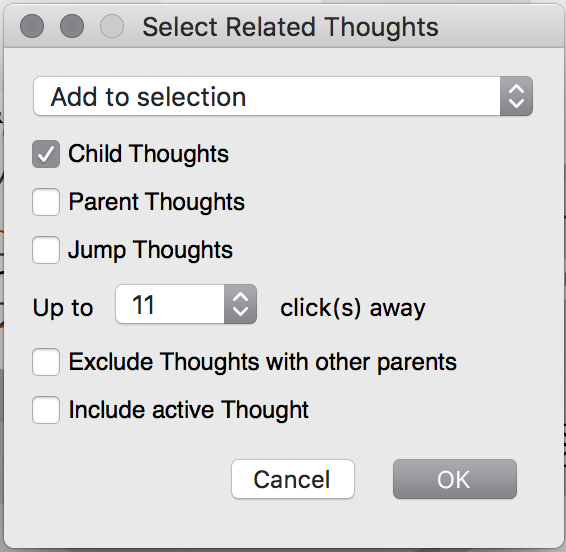 When the Thought Properties dialog is open a "Tags" button is available that will allow the addition or removal of any thought tag in the brain. This method is recommended if you have a lot of Thought tags to modify for an old thought, or if you are adding a new thought that needs a lot of Thought Tags. 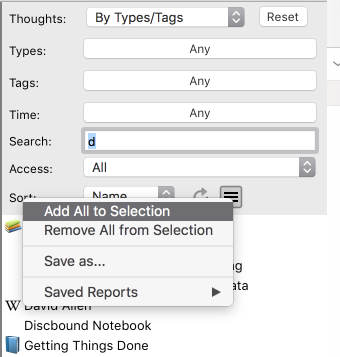 Don't forget if you are using the "Semicolon Method" to add multiple thoughts you can assign one or more Thought Tags in that dialog. By either selecting the thought tag from the Thought Tag menu or by searching for the Thought Tag with the search field you can make a tag the selected thought. 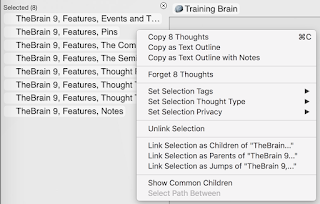 Once it is the active Thought, you can drag from the "Child Connector" and type in the name of a Thought you want to assign the said tag to. This process only allows the addition of one Thought Tag to a Thought in a single operation. In the "Thought" menu there is an entry labeled "Set Tags." Choosing "Set Tags" allows the addition or removal of a Thought Tag, one at a time. Just as I need to know what companies are using, I also need to know what features products may have. This includes software or physical products. This means you can further clarify what a Thought Tag means to a given database. Like many practices, tools, or caches of knowledge ones skill with TheBrain software will increase or decrease with deliberate use. [For more information on "Deliberate Practice" see Talent is Overrated by Geoffery Colvin. A book that will be reviewed at a later time]. But sometimes, just a few tips or tricks that allow you to use a practice, tool, or knowledge base more often is needed to help give you that push. This article is intended to help with that very subject. With apps for iOS and Android users of TheBrain 9 Pro Service, Pro Combo, or TeamBrain can use the mobile apps to sync back to TheBrain Cloud Services an thus, back to any desktop applications you might be using. This means thoughts and ideas can be added or extended from anywhere. With the latest versions of the mobile apps supporting automated sync, the use of the mobile apps becomes more and more advisable. I myself have used apps on my phone and tablet in every mode of transportation, while walking, even between meetings when an idea strikes me. Well thought out Thought Tags can help to ensure that you are not just throwing information into a never-ending pit. 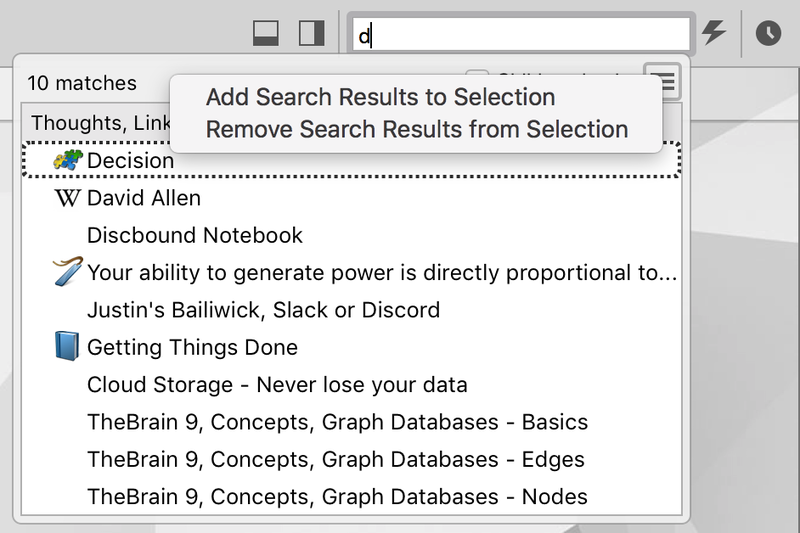 Sure, if you just record thoughts and never clean them up, you might be able to search out the small morsel of information you were looking for, but that is not the purpose of TheBrain software. There will be no relevant links to help you draw a bigger picture. You will not have had a second exposure to the information to strengthen your unaided knowledge and understanding. Getting in the habit of using tags, like these, will minimize the number of underdeveloped thoughts in your Brain. Sometimes you have access to a bunch of data on a Thought, and you just need to paste it and run. Rather than risking coming across this information weeks or months later using this tag can give you an opportunity to go back in your downtime and clean the data up. I do this as part of my weekly review as inspired by the GTD process. As of this article, the mobile apps are limited in many of the things they can do. Links cannot be labeled or typed. Attachments can be challenging to accomplish. Horizontal Rules cannot be added. Though these features may make their way to the mobile versions, it will most likely still be faster to do much of this from a desktop application for some time. As such, a "_Cleanup - Mobile Entry" gives a clear indication of the need and the reason for the required cleanup. I use this one in all forms of TheBrain UI's - phone, tablet, and desktop. This allows me to know that I need to pull more data, link a wiki page, get input from a customer or colleague. 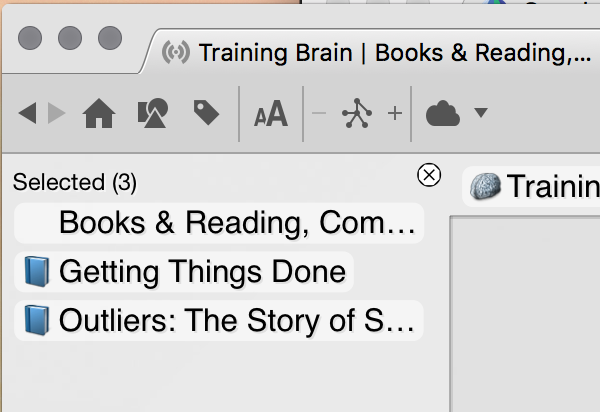 Having this tag enables me to "close a loop", GTD again, and focus on my thought flow rather than getting everything perfect the first time. This allows me to quickly find them in the Notes section of a Thought. I often come by random pieces of information that I just want to save, am not sure where it should be initially attached to, or can't find the parent thought or thoughts I would most like to connect the information to. This is where the "Random & Unsorted" thought and Thought Pin comes into play. Create a thought called "Random & Unsorted." I have created mine directly off of TheBrain's "Home Thought." Then you can pin the thought by right clicking on "Random & Unsorted" and select "Create Pin" from the popup menu. Once created and pined you know have a quick natural place to "catch" all of the little things that will help build depth into your brain. If you have found my articles interesting enough You may have tried to look at the other items I have written for this Blog and quickly found out that there are some significant gaps between articles. How can this be? You might ask - isn't this the guy that writes about habits and task list and other things that should keep me on track churning out copy every week? And you would be correct to ask that question. The answer is not complicated to figure out Evaluate, Prioritize, Execute. But it is essential to go through the process. With this philosophy, I can sort the current habits (good and bad) into one of 16 groups. It is critical that you are honest with your self as you build this list. It may be easier if you use a habit app like Todoist, so you already know what habits you are tracking. It may also be useful to listen to others to determine what habits you have that you don't even know about. The major groups -Professional, Health, Mental, and Social - are not to hard to make out, but there are some clarifications I would like to put out there. First, I use all four groups because they seem to balance out well. One works well with the other three. If you don't work on your Health, you won't have the energy for Social, Profesional, or Mental habits. If you are not improving your Metal capabilities, you will be left behind in Social groups, passed up in your Professional life, and may execute your Helth strategies all wrong. I could go on to all four, but I think you get the picture. As for the sub-categories, they are just the realization that we have positive and negative habits, and we have habits that support all that we do (Foundation), and practices that we are working on (Working). Some may call Foundation habits "Keystone habits". These are habits that either allow other habits to be more beneficial or enable other habits to be formed. For example, the Profesional habit of "getting up at 5:00 AM" provides the time for the Health habits of "working out" or "meditating." Due to this even if I have to stop working out or meditating I might keep getting up at 5:00 AM for the many other benefits. Though this process is going to be based on your own needs, it should be as simple as ranking your habits in most to least significant. Then, based on your time and energy budget, determining which practices you can keep, which you will do less frequently, and which you will 'let go' for the time being. Due to an increase in opportunities at work at the end of 2017 I had to go deep into this process. I found it easiest to drop most of the habits that were in a "working" group, both positive and negative. I had to be very careful with what I chose to keep. Too much and I would not be able to get the work done to take advantage of the opportunities. Too little and I would cause myself to burn out, unable to sustain the work pace and quality needs. It was clear many of the things I would keep. From Health - Diet, and Excercise. From Social - My weekly ballroom dance get-together. This allowed me to keep both my wife and my friends happy. Mental - I halved my reading load but increased the amount of fiction I was reading. This was enough to keep me from feeling like I had abandoned my mind, by not stopping my reading, while giving me additional distractions to allow my mind to reset, by reading more fiction than I normally would. As the goal was to take advantage of a Professional opportunity I dropped the least here - really only my working habit of improving my handwriting and working on adding "Sketchnoting" skills. I type all day so these are a vanity habits. By far the easiest part to say had hardest to do. You have to allow the things you said you will not work on this week to go by the wayside, you can work on them when your energy allows. You have to stay disciplined in ensuring you perform all of the habits you said you would keep. But it is not all discipline and sacrifice. Hopefully, you will have marked your weekly review as a Profesional Postive Foundation Habit and will have chosen to keep it. This means that in only a few days you can Evaluate and Prioritize again. Giving you the ability to adjust each week as demands change. As I the challenges I accepted are coming to a close I am taking the habits I put on hold, such as writing in this blog, and adding them back into my weekly lists. By ensuring that I kept the most important habits, I have come to the end of this opportunity with better health, a good mental feel, little to no damage to my social standing, and the professional respect of my company and coworkers. Maybe I should not even take the time to read this book and move on to something more intellectually stimulating like "Superintelligence: Paths, Dangers, Strategies" by Nick Bostrom. That surely would make me smarter. But I decided I was at the pool and my Kindle said the book would take me less than 3 hours to read. Why not risk it. I am glad I did. I was pleasantly surprised very quickly at Mr. Doepker's referencing of other books like "The Power of Habit" on how to make - and break - habits. Many habit books I have read have been full of theory, biochemistry, and studies. This book references several of those. But this book is not about that. It is about getting you moving. The core of the book is a 21-day plan to get your first "micro-habits" going. The book is intended to be read over 22 or 23 days (not the 3 hours I took). One chapter per day so that you can reflect on your journey to that point and educate your path going forward. Though not directly named by the author this book has three major sections. After a quick yet concise history of how Mr. Doepker used the methods described in this book to improve his life and the life of his clients, he goes into a breakdown of the basics of creating a few small habits, micro-habits, that the reader would use during the 21-day exercise of this book. As someone that has built many good habits in my life, I found myself nodding in agreement with Mr. Doepker's definitions and methods. If you follow them, you will select good initial micro-habits to start with. The daily chapters are short. Something you could read in less than 10 minutes per night. So they would not be much of a burden on even the most hectic schedule. Chapters seem to include another small bit of advice that would be well timed for that portion of the habit building journey. Each daily chapter builds off the one before it. Though direct in the advice given, there is a building set of sub-lessons, what the author calls "hidden lessons," that are pointed out in the final section of the book. In the final segment of the book, Mr. Doepker directly covers the "hidden lessons" in the daily chapters. But more importantly, he gives good advice on how to take this start and build on it. There is a good preview of the mistakes one can make in the building process, like being too inflexible. Finally, there is an excellent reference section so that ones newly formed habits can be taken even further by reading the biochemistry, philosophy, and lessons from others. If you had to start with one book on habits to be able to find many other good books, I would have to recommend this one. It has references to no less that 12 other books and authors in the habit building space. (There are actually 17 books and 9 recommended articles). I can even forgive him that three of the books he recommends are his own books. Though there is a significant amount of language that any former sailor would feel comfortable with, this is actually a serious book written in a language that feels more approachable to the people that probably need it most. I see the use of "adult" language as a means for the author to keep readers that are so frustrated with things in life that they most likely swear regularly to release the tension that is built up in them. This tension prevents them from being able to see a good plan to go forward. They can not see what to prioritize. And when everything is a priority - nothing is a priority. When nothing is a priority one does not improve their lot in life. Self-improvement and success often occur together. But that doesn't necessarily mean they are the same thing. After all, the only way to overcome pain is to first learn how to bear [the pain]. Problems add a sense of meaning and importance to our life. Thus to duck our problems is to lead a meaningless (even if supposedly pleasant) existence. I don't know how many people I know that try to live a problem free life. My favorite people are always the ones that have had a ton of problems and have successfully solved some of them and learned valuable lessons when they could not solve others. So if you are not offended by adult language, are looking for a different and frank look on how to get your life's priorities in order try out this book.